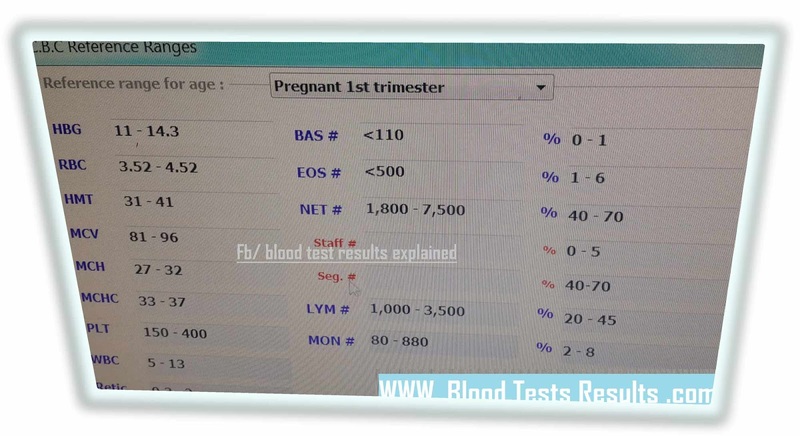 Normal complete blood count values for a woman in first trimester pregnancy. The table values are according to universal guidelines. Follow up CBC test during pregnancy course help in detecting early anemia or other blood disorders and thus helps both the mother and fetus. First trimester means the first 3 months of gestation which started from the first day of last menstrual period until 12 weeks through successful pregnancy course. Note that pregnancy consists of three trimesters, each of which has developmental events for the fetus and complications to the mother. How much hemoglobin should be in pregnant woman CBC test? It’s a frequently asked question in the laboratory by pregnant women who expect low hemoglobin level during pregnancy, actually most women do, but many women do not show anemic until birthday. Low hemoglobin in the first trimester means Hb value is less than 11.0 gram per deciliter. The minimum limits of RBCs count and HCT value are normally less than those in non-pregnant healthy female CBC test. The upper allowed normal limit of total white blood cells count increased from 11,000 to 13,000 cells per microliter of blood, this may be because increased production of certain WBCs during the course of pregnancy. Have abnormal results, please visit Fb page and send them to specialists.